When I was first introduced to Scientology I had so many questions because it was so unlike anything I’d ever experienced before. And for every question I asked there was an answer that not only made sense, but resonated with me as something profoundly truthful. And so I learned and studied more. I asked more questions and began to really embrace the philosophy and use it in my life, and the more I did that, the happier, more fulfilled and more successful I became. Two psychosurgeons discuss an x-ray before cutting into the brain of a patient in 1941. I come from a background of public servants. Many of my family members, including my parents, have dedicated their lives to improving their communities as teachers, volunteers and community activists. Growing up in that environment fostered a faith in the inherent goodness of people and in “the system”—the belief that the government and major public and private institutions are there to help you and make life a little better and easier. I still find that optimism infectious and empowering. So in my early days as a Scientologist, there was, for me personally, a certain intellectual dissonance between what I had been taught growing up and the information I was learning related to psychiatry as a byproduct of my Scientology studies. If psychiatry was the accepted mental health authority for local and federal governments around the world, how could it be bad, right? Two weeks after he started taking Prozac, he drove up into the mountains and shot himself. But as I started to study the actual history of psychiatry, its origins, its worldview and its real-world effects on people throughout the 20th century (and continuing into the present), my blind acceptance of its social authority began to crack around the edges. I began to look at the whole subject with fresh eyes, setting aside my own cultural bias and all the “everybody knows this is the way it is” assumptions I had internalized without even realizing it. I thought back to close family members and friends who had spent time taking antidepressants and other psychotropic drugs under the care of a psychiatrist or MD, and how it felt like they became completely different people while they were on them. I recalled getting the news that the brother of a dear family friend (a father of two small children) had gone to his family doctor because he was having trouble sleeping. He was prescribed Prozac despite having no history of depression. Two weeks after he started taking it, he drove up into the mountains and shot himself. I remember seeing interviews and hearing personal anecdotes from people who were diagnosed as schizophrenic who said that, as uncomfortable as it was when they weren’t taking medication, they still preferred it because when they took prescription drugs they felt completely dead inside, like zombies, and that, too, was no way to live. We stand up to the “high priests” of our time because we know people deserve better. We do it because we know that the human spirit is not only real, but it’s who and what we fundamentally are. And when I really started to educate myself I learned about a growing number of suicide attempts by very young children who were taking these drugs, something never documented before in all of human history. I learned about the record rate of suicide among foster kids and active military members (a group I grew up with and for whom I have the utmost respect and admiration) that parallels the skyrocketing rate of psych drug prescriptions (much higher than the general population). And all of that is to say nothing of the mind-boggling correlation between psychotropic drugs and mass shootings. And it got to the point where I couldn’t make excuses for all of it anymore. I couldn’t be reasonable about it just because I was bombarded with ads and commercials for these drugs every time I turned on a TV or opened a magazine, or because I wanted to trust “the system,” the people in charge who were supposed to have my best interests—and those of the average citizen—at heart. So why do Scientologists as a group make exposing and eliminating psychiatric abuse such a priority? It certainly isn’t because it’s convenient or popular or cost effective. After all, we’re David standing up to some of the largest and most lucrative drug Goliaths on the planet and we have been raked over the coals for it by the same media outlets who have profited so handsomely from all of those drug advertisements. A protest against psychiatric abuse in the United Kingdom by the Citizens Commission on Human Rights, a nonprofit mental health watchdog cofounded by the Church of Scientology. We stand up to the “high priests” of our time because we know people deserve better. We do it because we know that the human spirit is not only real, but it’s who and what we fundamentally are. We do it because we know that playing Russian Roulette with our body chemistry in order to attempt to handle the very real emotional and spiritual problems most people deal with—especially when that “treatment” creates suicidal and/or homicidal behavior in a percentage of people whom it’s supposed to help—is a violation of the public trust so fundamental and so heinous that the average person can’t even conceive of it. I mean, in what kind of backward, medieval world is sending thousands of volts of electricity directly into the brain of a child (so much electricity that they’re in danger of biting their tongue in half and shattering their teeth) promoted in hushed, academic, reasonable-sounding tones as a “solution” to any mental or emotional problem? The truth is that we are spiritual beings navigating the physical world with biological bodies. Our bodies can and do affect the way we perceive and interact with our environment. But we ourselves are not, and never will be, our bodies. And despite the billions spent and made trying to convince people they are simply cosmic accidents, in reality, the only true freedom to be found is found by addressing the spiritual needs of a person. That is what religion has done for thousands of years. The freedom to acknowledge the existence, importance and rights of every spiritual being is fundamental to everything Scientology represents. Scientologists are not expressing “disapproval” of the millions of people who trusted the information they were being force-fed and who turned to the pharmaceutical “solutions” they were sold in such a heavy-handed fashion. Scientologists aren’t trying to convert everyone to our religion or get them to see the world in the exact same way we do. But every Scientologist I know is passionate about relentlessly standing up for and defending the rights of every individual to seek his own truth, to explore his own spirituality, and to find his own answers—ones that will actually work for him. I come from a long family line of people willing to stand up for what they knew was right, whether or not it was popular, safe or lucrative for them. I am grateful for their example and I strive to do the same. 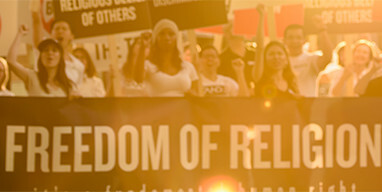 Scientologists are some of the world’s strongest and most effective advocates for spiritual freedom—yours, mine and everyone else’s. We look around and see psychiatry and big pharma apparently hell bent on turning everyone into a patient, a victim, a disease. And it doesn’t sit right with us because it just isn’t true. Musician, writer, business owner, human rights advocate, aspiring Renaissance Man.